Short post this week because I'm catching up from time in Traverse City for the Cherry Capital Con & I'm on a deadline (or three). Comics are stories. And while I enjoy a superhero bash-em-up from time to time, I want the diversity in comic stories & genres to be more widely known & appreciated. Here are three books that I have discovered at conventions this year which were all self-published by the creators and I think are deserving of wider recognition, not just for their conviction and bravery to self-publish, but also for their quality work. This is the first book in a series of three by Evan Dahm about a storyteller Koark keeping history alive as he searches to discover a lost story important to his people. What grabbed me about this book is the immersive world-building that Evan is setting up. I have not yet read the remaining two books, but I finished book one feeling I needed to (the story can be read online for free at http://rice-boy.com/ but I am waiting to acquire the physical books which may be tough for new readers as it seems the first book may have gone out-of-print... ). 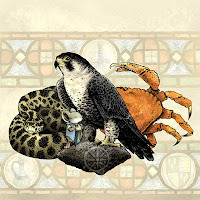 The fantasy world of Order of Tales is slowly unfolded through illuminated manuscript-like storytelling, race & culture designs, maps, and the sense that there is more to discover with every turn of the page. Brandon's ink work drew me to his booth when I passed it in the Phoenix Comic Con's artist alley. 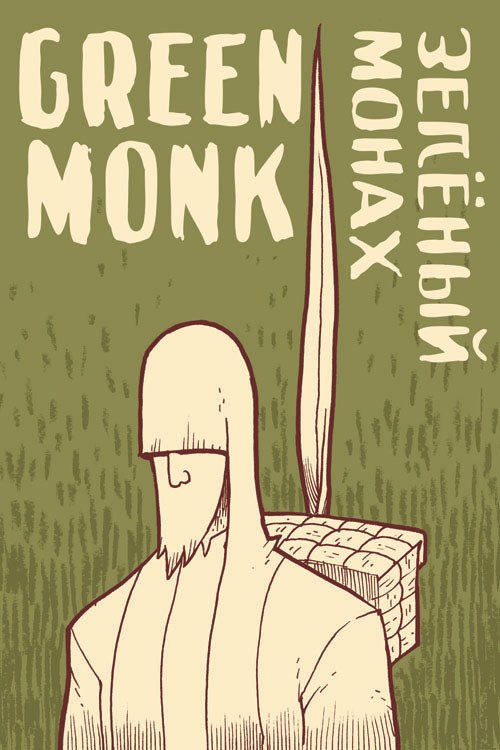 I saw his debut comic The Green Monk, a fairy tale of-sorts about a wandering monk who ,using an enchanted blade of grass, takes on a giant. After reading the story back at my table I went back and bugged Brandon several more times to talk shop about inking, pen work, his colored work (he had some lovely prints he colored digitally which looked hand-colored) and ultimately I purchased a commission piece from him for my Harry Potter themed collection. Titled "I did not agree to this" by Adakie. I really like the design for the front of Kenzie & Saxon's cloaks. They both look a bit young...perhaps this is when they were still tenderpaws in the Guard. 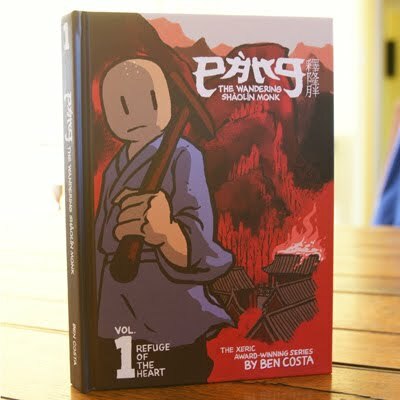 Looking over Black Axe #2, there are two examples of where the visuals were the result of fan interactions at conventions. I had no preconceived notion of how the Captain's Captain character Roarke would look when I started Black Axe (in fact, I didn't have anything specific for him when I started issue 2). I knew he needed to be surly and pirate like to fit in with the crowd I figured would populate the Mariner's Bell. I had also written the character's motives to be underhanded and swindle-ly when dealing with Conrad. Then it dawned on me, that a few years back, I had done a Conrad vs a Pirate Mouse piece. Seemed fitting to use that design again. Luckily, I had also already colored the piece for the 2010 sketchbook, so the design for Roarke was 98% done before I started. The other example of this is the visual representation of the history lesson of the Black Axe. In the past I have used illuminated manuscript based on the Book of Kells to be the visual portal into what could otherwise be boring exposition/explanation pages of talking mouse heads. This timer around, I wanted to do something different (also suggesting that all of Mouse History isn't recorded in this way, and that the Legend of the Black Axe is legendary enough to be found in multiple sources) but was stuck on what to use as a visual. 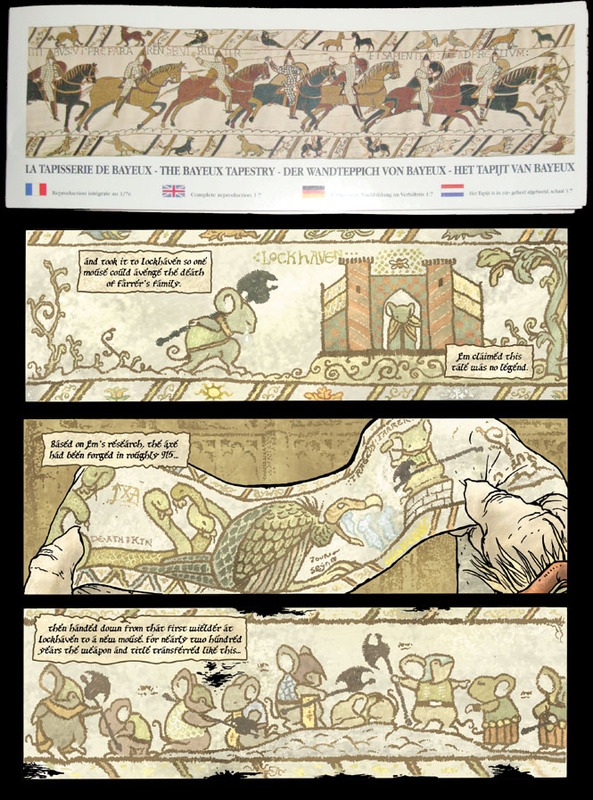 As I was headed to my shelf to retrieve a Kells reference book, I knocked over a fold-out scale reprinting (in book form) of the Bayeux Tapestry a fan had given me as a gift last year at a convention. I loved how the tapestry is essentially a long comic narrative, mixing images with words. Had it not been for that fan being so kind, I wouldn't have been led in that direction. Ok, so that heading may seem a bit skewed, and may seem like I'm chalking up other classes I took as rubbish (which they weren't), but what I'm getting at is that 2-D Design 101 (or whatever the course number was at Mott Community College) was the class that switched on a lightbulb in my mind and offered me something new. Other classes were more about assignments that forced you to practice or pushed your comfort zone, while for me, 2-D was about discovering new information. In 2-D I learned a language for things I took for granted: contrast, focus, balance, color, value, negative space, etc...AND how to manipulate them to achieve a visual goal. 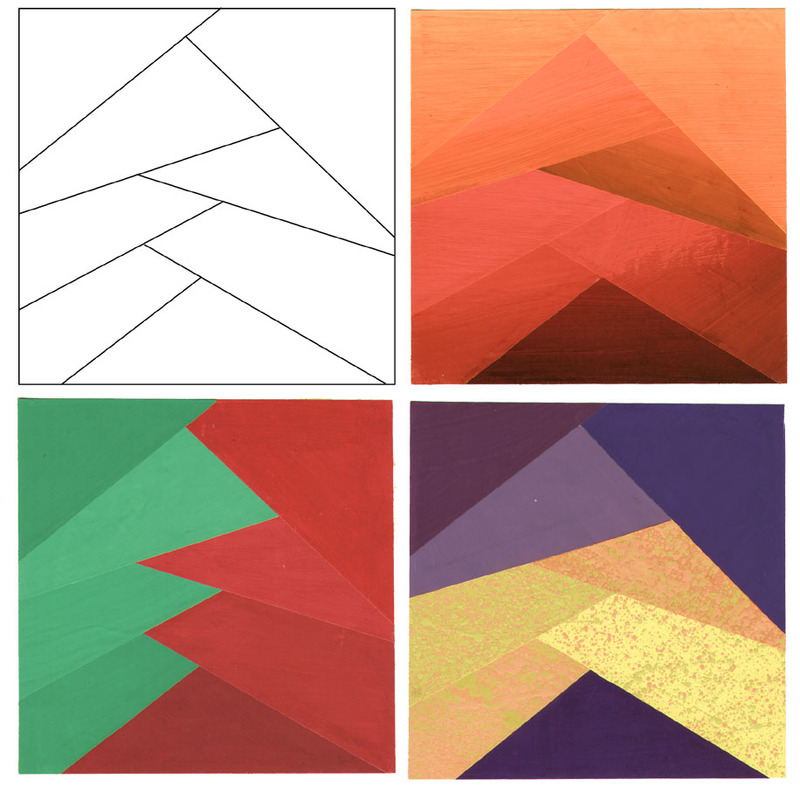 In this example, we were assigned to take a layout of shapes, and with three different color harmonies and placements, design three very different images. In the orange one, I was going for a subtle vertical transition from darker reds to lighter oranges. The green and red was designed to split the image aggressively into a left and right (and make the zig zag line between them a focus). And lastly, in the violet & yellow one I wanted to bring out that yellow elbow shape as the focus. Using contrast (of color, value, and texture) I was able to make the three images look (somewhat) different. 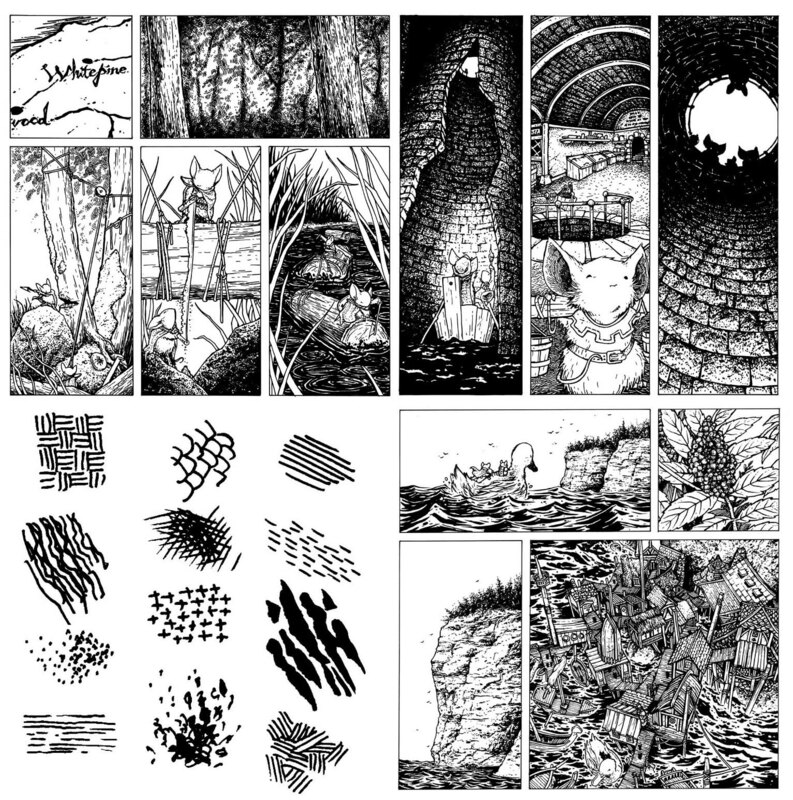 With my inking on Mouse Guard, I still use this concept with patterned linework. One of the points of contrast is to make touching areas either leap off of each other (high contrast) or blend together (low contrast). So to separate mice from backgrounds or overlapping characters I vary the style, texture, pattern, and thickness of lines to create contrast. And that is before I ever bring color into the page. 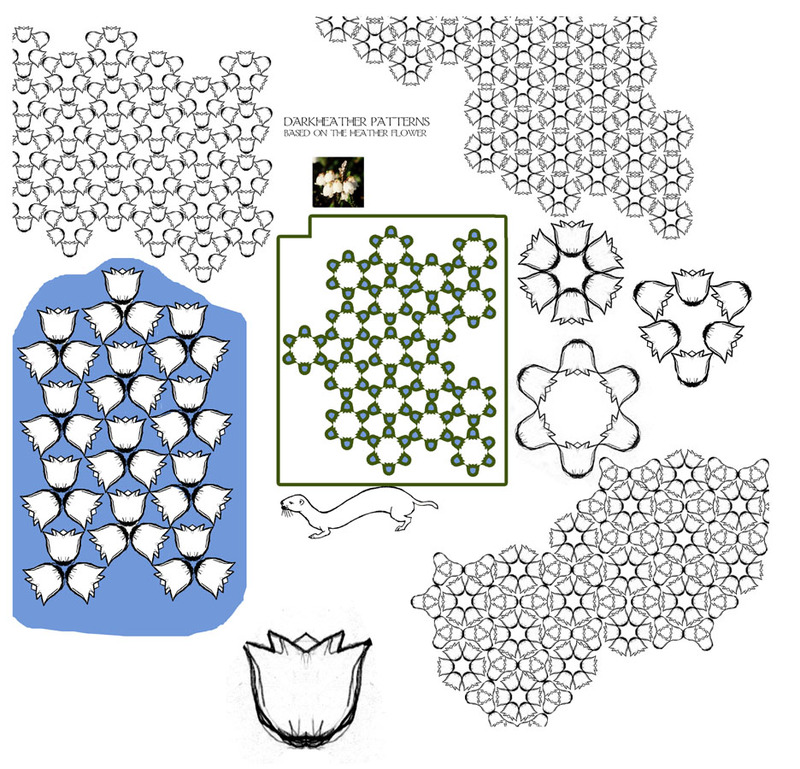 Shape, pattern, & contrast became the framework for what my drawings & subject matter needed to fit into. 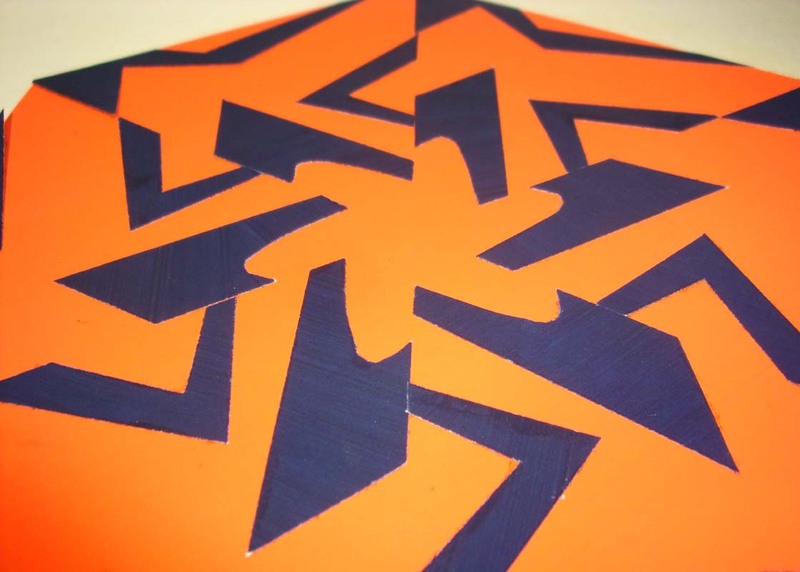 In another assignment, we were to create a design on an equilateral triangle and through mirroring and repetition, create four different hexagonal designs. This assignment (as did most every assignment) also featured some color theory, but I want to focus on the pattern design aspect. 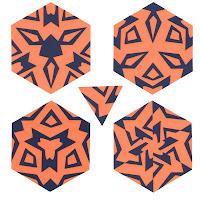 While I was called out by the professor for a few shapes still being recognizable & in similar configurations (remember the assignment was to make 4 very different hexes.) 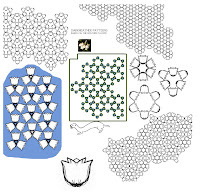 overall the hexagons were satisfactorily different enough for a good grade though. 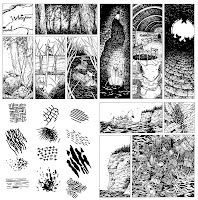 This lesson came back to me when in Mouse Guard it was time to cover the walls of Darkheather in tile patterns similar to Moorish tilework, but without their iconography, substituting weasel iconography instead. I drew a stylized heather flower bud and then put the 2-D skills to work and came up with a variety of tile patterns. And I could put my lesson's mistake to good use, I have a few designs there that are very similar, and a few that are more different. Depending on how much contrast I wanted in adjacent tile areas, I had a pattern to do the job. Though computers were well infused in education and design when I was starting college, we did not use them for this class. So all these assignments were done by mixing paint to specific colors & values, then painting them evenly on paper so as to not leave visible brush strokes (though later we could when trying to implement texture). The paper was then carefully trimmed with xacto knives, and lastly glued down with rubber cement so that there was no trace of residue. I may have groaned at the time about "how much easier this would be to do on a computer" but I'm glad I didn't. I may have still learned the design concepts, but I wouldn't have learned the Mr. Miyagi-type lesson of craftsmanship: no fingerprints, name in the right place, no exposed glue, no visible brush strokes, etc. It was a big part of our grade (1/3 most of the time). I think about the idea of craftsmanship being 1/3 of the grade on every page I do. 2-D Design class got me onto the path of thinking about an image before I start it (or at least before I try and finish it). 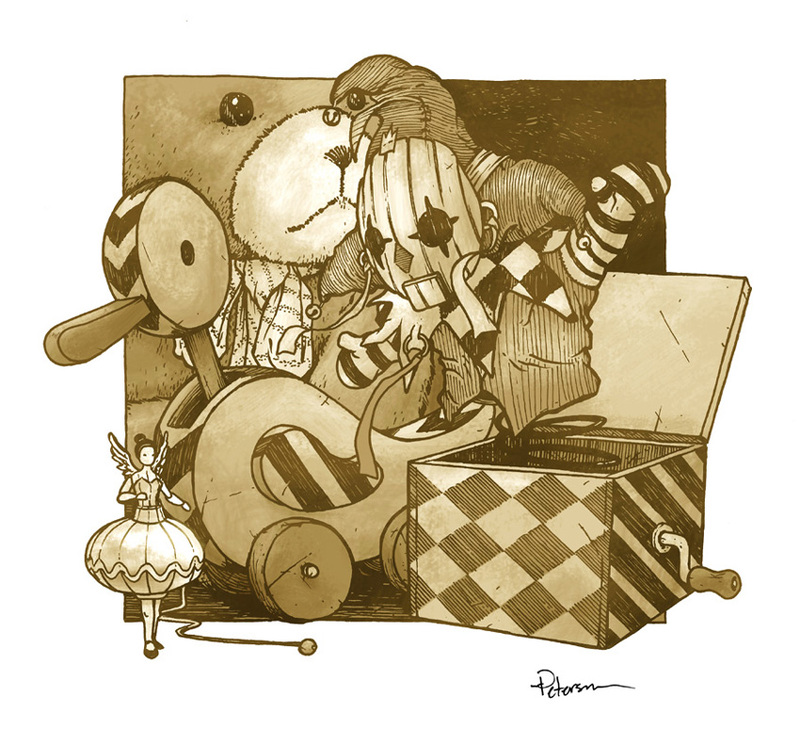 It was printmaking that fully forced me to really process what my end goals were for an image, and what techniques executed in what order would get me there. 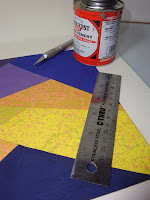 No coincidence, it was my 2-D design professor Sam Morello that also taught Printmaking. 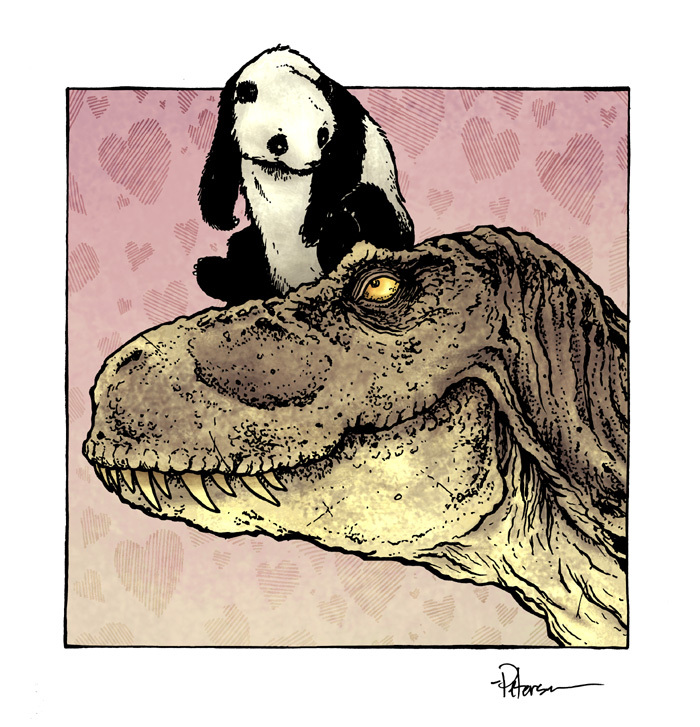 I am very proud of the story from this year's Free Comic Book Day flip-book. 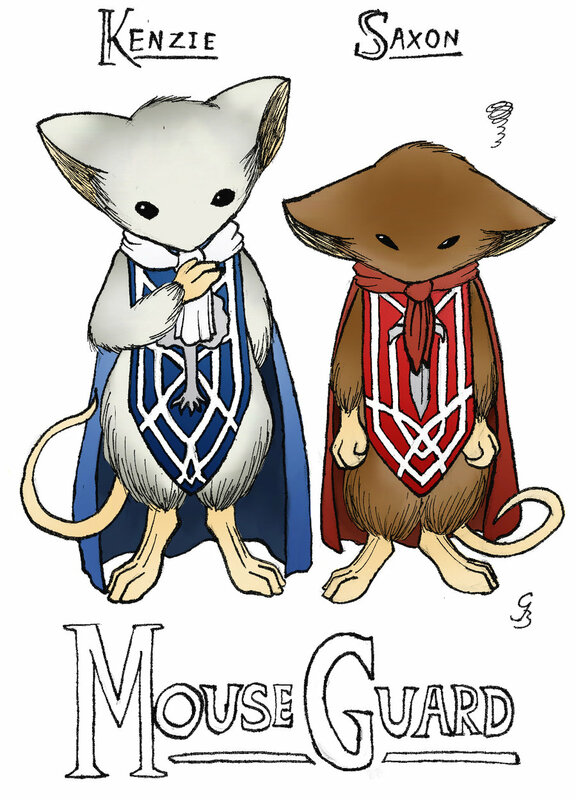 I am continuing to get emails and tweets from fans who discovered Mouse Guard through the story and from existing fans who loved using it as a gateway for their friends and relatives to get into the series. So I wanted to take a post to talk about my process in getting that story finished. In case you missed this year's issue, you can read it for free online at Graphicly.com here before reading the rest of this post. 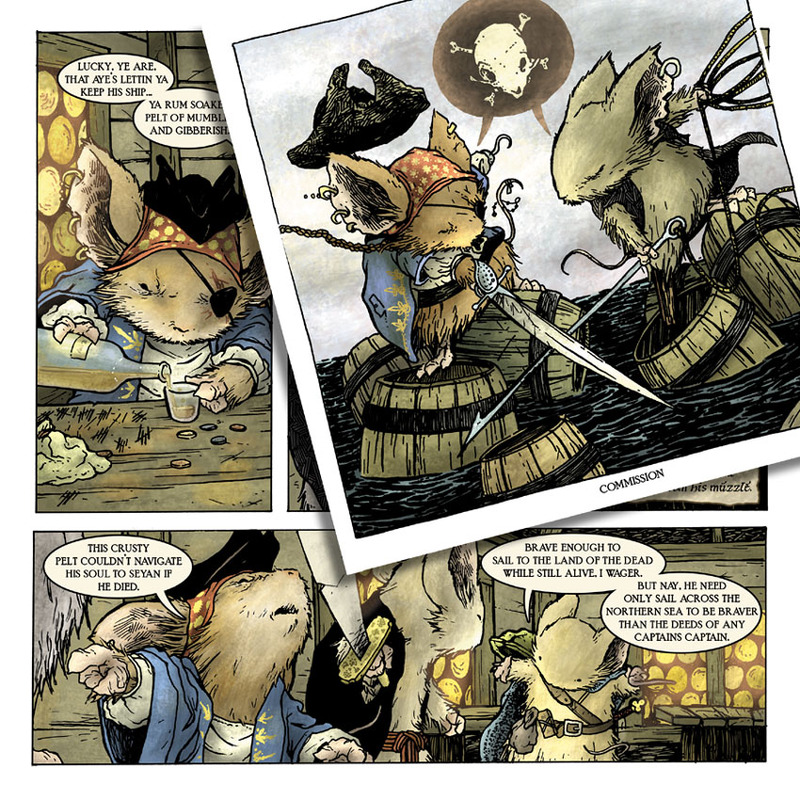 Last year I found the task of writing short a Mouse Guard story for FCBD rather daunting. It needed to be accessible to new readers who have never seen Mouse Guard while still having something new and plot-connected for the existing fans. I was able to do a story that worked, but this year I felt I had to try a new approach. After the success of Legends of the Guard, I thought it would be fun to change the FCBD story format to be more like a folktale or Legend. With the story being told to a younger aged version of a known character, I could show how something as simple as a bedtime story could shape who that mouse became. On a car ride to a friend's house I started thinking of folktales I liked which I could just do a comic translation of with mice. J.K. Rowling's Tale of the Three Brothers (featured in the Deathly Hallows), Chaucer's Pardoner's Tale (from the Canterbury tales), and Snow, Crow, & Blood (I had re-written a version years ago). What they all featured were a series of items, used in succession which change the outcome of the ending. I then settled on a trio of concepts that are frequently echoed in Mouse Guard: Aggression, Defense, and Wisdom (Saxon, Rand, & Kenzie-- Swords, Strongholds, & Diplomacy). I couldn't come up with a "wisdom" item that would work to twist the ending and swapped it for poison, but made wisdom the key attribute to acquiring and successfully using the items in the correct sequence. Therefore, it made sense that I have a young Kenzie (the character's name means 'wise') told the tale that would shape his future. The Hawk, Crab, and Snake would gift parts of themselves in their greed to get a greater claim on mouse-prey. A talon became a sword, a shell became a shield, and poison became..well, poison. The process of making the pages is my standard: break down the script into 1 page chunks, sketch the panels in a sketchbook, scan the sketches and assemble them in a Photoshop template of the page with placed text blocked where I think it goes, print out those layouts, and ink the final artwork on bristol using a lightbox to follow my layouts as guides. Lastly I scan the inks, and color the artwork and make final text changes. with the power outage later that week I never got a good chance to catch up on the posting.